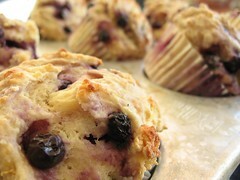 Buttermilk Blueberry Muffins - Do You Know The Muffin Man? Notes: I substituted some flour with a half cup of soy protein isolate, but I'm not sure if that's responsible for why the muffins turned out so pasty. Most likely, I underbaked them. This blueberry muffin will not be entering my repertoire, nor my stomach.